On the night of November 26/27, when returning to Malta from an attack on the German airfield at Gerbini in Sicily (20 kilometers inland from Catania, near the intersection of the A24 & SP24 roads), Malcolm was flying on one engine when the second engine of his twin-engine Wellington seized up. He had recently flown the same aircraft ("Q", s/n W5550) on several occasions, without incident. He had also returned from other ops on one engine, from further afield, yet this time both engines failed and he was forced to ditch in the sea. Malcolm could see the lights of Malta, when, with landing lights lit to enable him to gauge the waves, he attempted to stall his aircraft safely onto the sea. However, the tail caught the crest of a wave tipping the nose down so that it slammed into the next wave, abruptly stopping the aircraft. Like many pilots, Malcolm was not wearing his shoulder harness. Consequently, his head hit the instrument panel, knocking him out – and putting a nasty gash on his forehead above his right eye-brow. Left for dead, Malcolm regained consciousness under water. 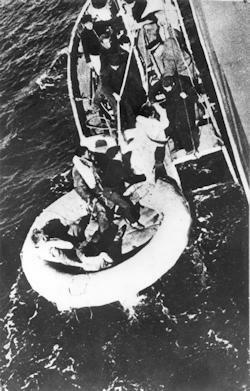 He was able to exit the aircraft through the windshield and join the crew in the lifeboat. Realizing F/O Cope (navigator) was missing, he swam back to the aircraft. However, Cope had died, either during the forced landing or, knocked out, had drowned. In the distance they could see the search underway that was deployed to rescue them. There were flares in the lifeboat, but no pistol with which to fire them. The pistol had been screwed so tightly to the aircraft (to prevent its theft) it became impossible to retrieve before the aircraft sank, about fifteen minutes after ditching. All they could do was watch helplessly as the wind and sea currents carried them away from Malta. Worse yet, most of the supplies had been stolen from the life-raft leaving them with a dozen aspirins and half a pound of chocolate – which they shared parsimoniously. Worst of all, they had no water. But fortunately for them, the weather was cool (it was late autumn) and the seas calm. If it had not rained on the fifth day, they would surely have died of thirst. Dear Peter, I doubt that Cochrane is still living. Perhaps S.A. records or archives or an ad in one of the S.A. veterans publications could connect you with his family. As POW's we described the circumstances of our capture with each other. My recollection is that upon return from an operational trip from Malta, your Dad was forced to land in the Med. just short of Malta. (I don't know the date).They survived the water landing within sight of Malta. He was unable to retrieve the Very Pistol, acessible to the pilot, and clamped to the aircraft above the windscreen. The reason being that the ground crew had overtightened the clamp and he couldn't release it, and the aircraft sank. In the dinghy, and within sight of the island, but without signalling equipment, they drifted away and were picked up by an Italian hospital ship 10 days later. Regards, Ray. Cousin Frank A. Watt, bomber and later commercial pilot, thought the Wellington Mk.II was underpowered, and the Merlin engines heavy and unreliable. Malcolm accused the Egyptians & Maltese who came on base of stealing the supplies out of the life-raft – consequently, he never had a polite word to say about them. The Wimpey sank in about fifteen minutes, per Malcolm (as reported in La Nacion, 23 Dec. 1943); the "African headquarters" account (as reported above in The Buenos Aires Herald, 27 Oct. 1943) said the Wimpey sank in 30 seconds, which is implausible – deploying the life-raft alone would have taken longer. On 29 November, 1942, Malcolm's parents were advised by telegram that he was missing on Active Service. The telegram was followed by letters from his Squadron Leader (29 Nov.'42) and from the RCAF casualties officer in Ottawa (30 Nov.'42). The letters were likely not received until late December. Malcolm was able to climb the stairs unaided but two of the crew were so weak they had to be carried. In a sense they were lucky it was a hospital ship for they were well taken care of, initally being fed only small quatities. 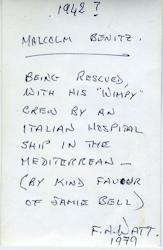 The ship took them to Tripoli (Libya) where they were hospitalised and interned as POWs. 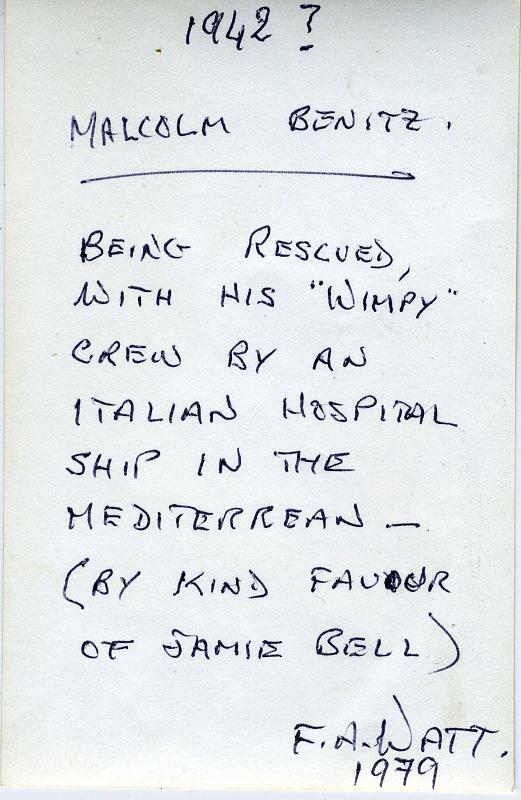 In a letter to his family (dated January 5th, 1943), he wrote: "I was picked up in the sea with my crew by an Italian Hospital ship after we had been floating and drifting 10 days – so we were glad of some food and water! They treated us very well on the ship. My navigator P/O Cope, a grand fellow, was killed when we force-landed in the drink. The rest of us were O.K. I got a slight cut on my forehead." In a letter to Margaret Douglas (dated January 13, 1943) he provides other details: "I’ve been in the bag since Dec. 5th when an Italian Hospital Ship picked my crew & me up in the Med. We had been drifting for 10 days after force-landing in the sea and were pretty done-in by then as we had no food or water with us. They treated us very well on the ship feeding us nothing but liquids the first day, in small quantities. Unfortunately my navigator was killed when we landed in the sea. The rest of us got away with a few scratches." On the last full page of his Africa notebook (shown below), Malcolm wrote down a record of what happened after he and his crew were rescued at sea. It is likely Malcolm wrote these notes long after his ordeal (Please see our discussion about the notebook). It is also likely that his diary of the “dinghy ride” contained more detail about his first days as a POW, but during his later escape from the POW camp, he left that diary with a fellow escapee (Major F.H.G. Cochran) – it has not reappeared. Bill Thrower. Parkinson. Haxton. Jones. In evening to Med Hosp. 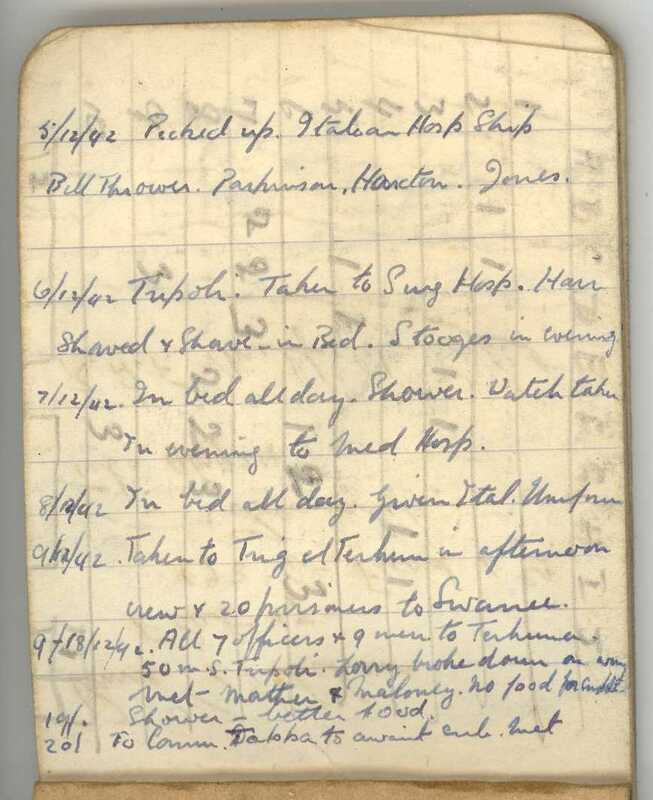 9-18/12/42 All 7 officers & 9 men to Terhuna [Tarhunah ]. 19/. Shower – better food. In hospital he was told to take a shower, during which his RAF uniforn was stolen, replaced with an inferior quality Italian uniform. Malcolm met an Italian officer from Buenos Aires, a major in the army. They did not get on. During the truck ride to Tarhuna, the truck broke down and they had to return to Tripoli for repairs before completing the journey. In late December, 1942, Malcolm and a group of fellow POW officers were transported in an Italian submarine to Taranto (on the south coast of Italy). He said the submarine stank and its crew was terrified of being discovered and sunk by the Allies. Trig el Terhim: Because it is mentioned with Swanee, likely in Tripoli. Swanee: Likely Al-Swani or Swani Road, SW of / next to Tripoli. Terhuna: Almost certainly Tarhunah, located in the desert 65 km. (40 miles) SE of Tripoli. Malcolm was held 9 days at Tarhunah, 9-18 December. Comm Tappa: No idea, but likely nearer the port (in Tripoli?) than Tarhunah. Malcolm does not mention that on 6 December, 1942, the day after he was rescued, he wrote Margaret Douglas in England asking her to inform his family that he was OK (His letters are on his POW page). The card has no date of receipt, but it was probably delayed several weeks going through Red Cross channels. On 19 January, 1943, the RCAF casualties officer in Ottawa wrote Malcolm's father informing him that Malcolm was now a P.O.W. – the letter likely did not reach "La California" until February, 1943.